Purchased in partnership with the Reid family, Talbalba Herefords, $14,000 Lismore More was the top price at Glenwarrah’s 2010 Sale. 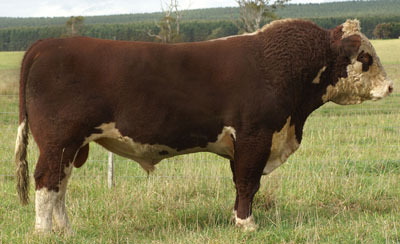 A sire with excellent carcase and muscle down his top line, while retaining true Hereford cosmetics and softness. Lismore More is a trait leader for SS. He was represented in our Hereford National team 2014 by $18,000 Black Heart,purchased by Talbalba Herefords. Lismore More’s nine, sons sold to date, have averaged $5,900. We have seventeen daughters in herd.